* Since first posting two months ago, we’ve learned of several more breweries planning to debut in 2019. Additionally, 7 of the pending breweries we previously listed have opened. Here’s the latest update. Despite seven consecutive years of double-digit brewery growth in Massachusetts, 2019 shows no signs of slowing down. We now know of 49 new breweries setting their sights on a debut this year, which would put the total for the Commonwealth at well over 200 – double what it was just five years ago. Are we getting to a saturation point? That’s a discussion for another upcoming blog post. For now, here’s our list of the 49 new breweries (12 are existing brands), and 5 new taprooms, that hope to open before the end of 2019. (Now open) Beverly had the honor of welcoming the state’s first new brewery of 2019 this past weekend when Channel Marker Brewing opened its nano brewery and taproom to rave reviews. As we reported a while back, they plan to steer hopheads to their Beverly brewery by specializing in hazy, juicy New England style IPAs. (Now open) Black Rabbit Farm Wild Ales in Southwick has already bottled its first six Farmhouse Ales. They plan to open for weekend tastings and retail sails as soon as the bottle-fermented offerings are ready, likely within the next two weeks. Watch their Facebook page for updates. (Now open) Redemption Rock Brewing in Worcester is also close to opening. The states’s first registered B Corp brewery, which means they’re legally required to consider how business decisions impact their workers, customers, and the environment, has its first batches of beer in the fermenters. Pending final inspections, they hope to open their community-focused micro brewery, taproom and cafe later this month. (Now open) “It’s coming together,” says a recent Facebook post from Holyoke Craft Beer, who has tentative plans for an early February grand opening. If you’ve got any connections, see if you can finagle an invite to one of the soft openings planned for their downtown nano brewery and taproom in the coming weeks. Maybe we’ll see you there. (Now open) Shooting for a March launch of its brand, Wandering Soul Beer is aiming to have a limited amount of cans and kegs of its Melody Maker IPA in distribution by the end of that month. Having perfected the recipe at its production pilot brewery in Beverly, the plan is to have it contract brewed. (Now open) Sena Farm Brewery in rural Worthington has a similar timeline. They hope to debut their nano brewery and taproom within the first two months of the year, providing an oasis in one of the state’s few remaining craft beer deserts. *Update: They have started small scale production for local keg accounts and are working on the taproom buildout currently. (Now open) Once highly heralded home brewers with commercial aspirations, Vitamin Sea Brewing started producing small batch offerings for select keg accounts this summer. Soon, its much anticipated Weymouth micro brewery and taproom will open to the public. The plan is to debut in early February, possibly a bit earlier if circumstances permit. Artwork for several of Vitamin Sea’s can designs, as well as this mural at their Weymouth brewery, was done by Dean McKeever. Photo courtesy of the Vitamin Sea Facebook page. (New) Though its still in the planning stages, Brockton Beer Company recently launched a partnership with Article Fifteen Brewing to brew and share some collaboration beers at a series of tasting popup events. They hope to open a micro brewery and taproom in downtown Brockton in late 2019. Lost Shoe Brewing and Roasting in downtown Marlborough is close to brewing, and is thinking late January or early February for the debut of its micro brewery, coffee roastery, and taproom on Weed Street. *Update: They are currently waiting for National Grid to connect their power so they can start brewing. The public timeline for the new Night Shift micro brewery and taproom at Boston’s Lovejoy Wharf is early 2019. Described as their “Boston Innovation factory for serving experimental small-batch beers and inspired comfort-driven small plates,” it will include a coffee bar, extended taproom hours, and a late night menu on weekends. *Update: the will officially open to the public on March 20th. Also hoping to launch by the end of the month is Fieldcrest Brewing in Wilbraham. As soon as they’ve finished the electrical upgrade on their micro brewery and received approval for their taproom pouring permit, they plan to begin brewing. Production brewery 6A Brewing in Sandwich is converting the former site of Flynn’s Irish Pub in Sagamore to a taproom and retail space for its beers. It’s slated for a late February debut. *Update: They are currently targeting April 15 as an opening date. Also targeting a late February launch, assuming the countdown clock on their website homepage is accurate, is BearMoose Brewing in Everett. If so, their micro brewery and taproom should be ready for visitors at the end of the month. *Update: Their opening has been pushed back to April. Another Boston brewery set to open before spring arrives is Distraction Brewing in Roslindale Village. Construction of their cozy nano brewery and taproom on Belgrade Ave has taken longer than expected, but the finish line is in sight. News has been lacking on when Bruno’s Brewery, a subsidiary of Boston Winery in Dorchester, plans to open its next-door micro brewery and taproom. It’s already licensed, so it wouldn’t be a surprise if it happened in the first quarter of 2019. (New) New brewing equipment was recently installed in the building formerly occupied by the Plotkin Furniture warehouse on Marble Street in Athol for Pending micro brewery and taproom Atlantic Brewers & Distillers, which owner Joseph Gochinski says should be open as early as May. Chicopee’s Leadfoot Brewing has its tanks in and is currently finishing up piping for steam and glycol. They plan to “put the pedal to the metal” for a spring opening of their micro brewery and taproom once they’ve had a chance to brew a few test batches. Also hoping for a spring opening is existing contract brand White Lion, who received the equipment for its downtown Springfield micro brewery and taproom in December and has begun installation. Their federal licensing process could be impacted by the current government shutdown if it lingers on. Related: Tickets available for our March Madness IPA Tournament! Details and ticket links below. Help us crown the best IPA in Massachusetts! 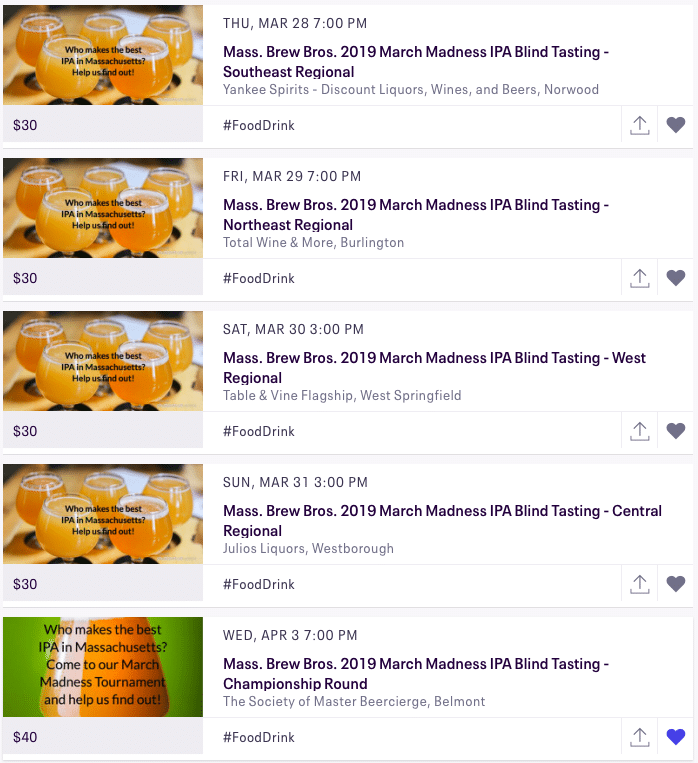 A limited number of tickets are currently available for our March Madness Blind Tasting Tournament sessions being held throughout the state. Click here for tickets. In Peabody, Granite Coast Brewing seems to be in the final phase of its from-the-ground-up renovation. They’re personally completing the fishing work on their micro brewery and taproom and should likely receive permission to start brewing by the end of the month. It should only be a few more weeks from then before an opening, so a late February kickoff date seems feasible. *Update: the likely opening date has been pushed back to April. Also on the North Shore, East Regiment Breer Co. has been working away on its nano brewery and taproom in Salem. We’re not sure exactly when they plan to open, but based on their recent social media posts it seems like some time in the first quarter of 2019. West Springfield micro brewery Two Weeks Notice, currently open only on Saturdays for retail can sales, is in the process of building a taproom that it hopes to open in late March or early April. As we reported a few months back, Kismet Brewing will be opening a micro brewery and retail space on Broad Street in Westfield, briefly the home of Two Weeks Notice before the co-founders parted ways. No details have bee shared on exactly when they plan to be up and running, but their brewing system was delivered just before the holidays. (New) The Agapé Brewing Community, a non-profit group with a mission to “brew beer, build community, and change the world,” plans to open a nano brewery in Gloucester and begin distributing kegs and cans in May. Existing nano production brewery and contract brand Old Planters finished pouring the floors for its new Beverly micro brewery and taproom on the last day of 2019, and has targeted a May opening. As we reported in a blog post several months ago, they’re one reason the North Shore is one of the up-and-coming craft brewery destinations in Massachusetts. Also anticipating a May debut is Tackle Box Brewing, a nano brewery that plans to take up residence inside the Strange Brew Home Brew shop in Marlborough. They recently introduced one of their beers, Ripped Lip IPA, in the existing Strange Brewery taproom, but the building will eventually be home to both of them. Opening day is a moving target for Backbeat Brewing, which is under construction in Beverly. They aren’t comfortable making any official public estimate, but expect to be open before the end of May. (New) Developers are working with Easton’s Shovel Town Brewery on a proposal to open a second micro brewery and taproom at the former firehouse and Keating Funeral Home property in Foxboro. If all goes well, they could be up and running by the end of the year. 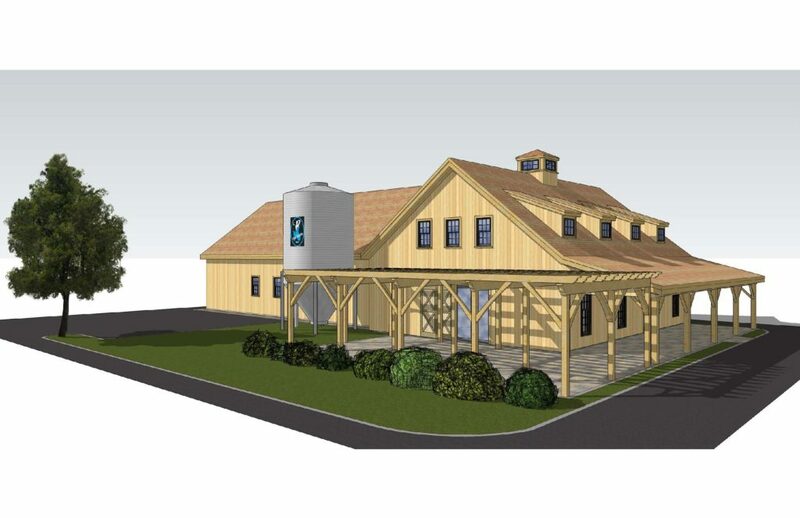 Though not new, Start Line Brewing in Hopkinton will have a new look by summer time, when they expect their brewery and taproom expansion to be complete. Don’t worry, you can still visit the existing taproom while renovation of the former farm store into a larger taproom and stage for live performances is completed. Two others that are reportedly in the midst of expansions are Abandoned Building Brewery in Easthampton, which would increase production and add a second taproom, and Amherst Brewing, opening its own taproom inside of the Hangar Pub. Not only could Provincetown get its first brewery in 2019, but by the end of the year it might have two. 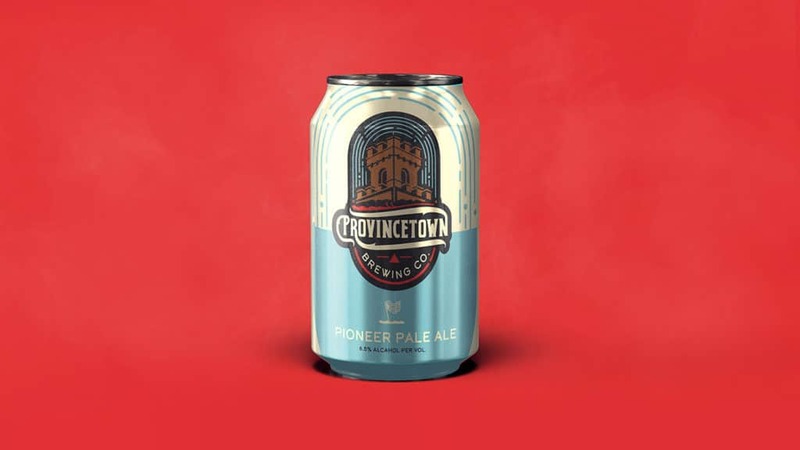 Billing itself as the country’s first gay beer, Provincetown Brewing Company launched this past fall, though it won’t be brewing until Memorial Day at the earliest. The brand plans to have a nano brewery and taproom downtown, but will also have its core beers contract brewed elsewhere for distribution in cans. The second P-Town brewery, which has no official name yet, would be an expansion of the existing 1620 Brewhouse on Commercial Street, a restaurant that specializes in its craft beer offerings. The owner proposed replacing the Art House theatre with a micro brewery and taproom, and eventually adding a brewpub. Initial reaction wasn’t totally supportive, so plans may have to be adjusted. Founded on progressive ideals and activism, Provincetown Brewing plans to donate 5 percent of its can sales to the local community and a variety of charities. Image courtesy of designer/illustrator Adam Koon. 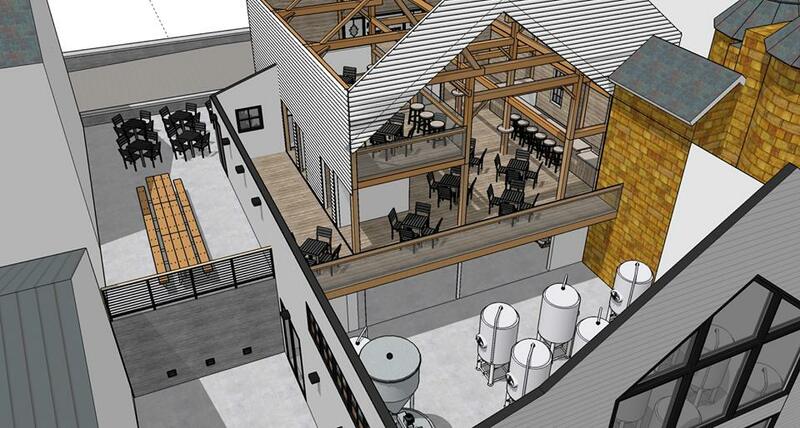 Having just completed a successful crowdfunding campaign, Brato Brewhouse and Kitchen plans to start construction on its Brighton micro brewery, kitchen, and taproom next month, with hopes of a late spring or early summer opening. No definitive word yet, but it looks like production outfit Berkley Brewing should have its new Taunton micro brewery and taproom open before summer. According to a recent post on their Facebook page, “a few final mechanical finishes and button-ups are being done before the sheet rock goes up and the brewing system gets installed. Faces Brewing is currently on pace for a late spring or early summer launch as well. The plan is there for a unique gastropub and micro brewery in downtown Malden. (New) Come June, the city of Lawrence is likely to have its own hometown brewery when pending Spicket River Brewing debuts its micro brewery, taproom, beer garden, live music venue and event space in the same downtown building the houses the Essex Art Center and the Acting Out! Theater Company. Construction is finally under way at Aquatic Brewing in Falmouth, who hopes to open its micro brewery and taproom some time this summer. They’re fully licensed, so once construction is complete they can start brewing right away. Also in Falmouth, Bad Martha, the seasonal brewery, taproom and beer garden on Martha’s Vineyard, is aiming for a July opening of its new off-island micro brewery and taproom. But “a lot of work has to get done between now and then,” they told us. Rendering of Bad Martha’s future year-round, off-island micro brewery and taproom in Falmouth. Image courtesy of Architectural Innovations. Another pending brewery that’s aiming for a summer premiere is Oakholm Brewing in Brookfield (pictured in the featured image for this blog post). Located on a 100-acre farm, they’re awaiting state licensure as they build out their micro brewery and taproom in anticipation of a late August or early September opening. Veteran owned Anawan Brewing is finishing up its licensing process and pans to start the build out of its nano brewery and taproom in Rehoboth next month. The decorated home brewers are estimating a fall opening. Another noted home brewer, As Built Brewing, who recently brewed the Resilience IPA fundraiser beer and raised $1,000 for the Camp Fire relief effort, has secured a lease on a space in downtown Franklin. They hope to be open sometime in the fall. Henry and Fran Brewing, a veteran-owned 5-barrel production brewery that produces highly sought IPAs, specialty Stouts, and distinctive Sours, will make it easier for fans to find their beers when they open a new micro brewery and taproom a few miles from their brewery in West Boylston. The last time frame we heard was for an opening during the first quarter of this year. *Upadate: a likely opening has been pushed back to fall of this year. Existing contract brand Arcpoint Brewing will replace its current production pilot brewery in Belchertown with a micro brewery and taproom. They plan to break ground in the spring with hopes for a late fall opening. *Update: The hope to be open on the former Belchertown State School property by the end of the year. Hudson’s Medusa Brewing has been pretty mum about its new project, a 10,000-square foot production facility just down the street from its existing brewery. Plans call for a taproom and patio at the new location, but no time line has been announced. The design has been in place since March, when the planning board signed off on the project, so it seems likely it should be ready some time this year. Another familiar brand, Spencer Trappist Brewery, is in the final phase of planning its new taproom, which they hope to debut in 2019, though no firm timeline has been set just yet. Vanished Valley Brewing in Ludlow also has big things in store for 2019. The plan is to take over the Europa Restaurant and convert it into a larger brewery and taproom, as well as a small kitchen. “We want to create an environment where people can relax and enjoy the company of others while sharing some hand crafted beer and delicious food,” says head brewer and co-founder Josh Britton. The intention is to launch this year. A couple of towns over, Great Awakening Brewing has secured a space just a mile off exit 3 on the Mass Pike in Westfield. The plan is to open a micro brewery and taproom before the end of the year, earlier if possible. Also in Westfield, Skyline Trading Company has been providing creative food offerings, a revolving craft beer list, and home brew supplies to appreciative patrons for a couple of years. Now they’re looking to add their own nano brewery to the mix. Currently they’re looking at properties in the area and hoping to be up and running before the end of 2019. (New) As reported here a week ago, pending Loophole Brewing Services announced plans to open a 13,000-square foot state-of-the-art brewing facility and taproom in Holyoke by the end of 2019. In addition to brewing its own house beers, they will specialize in serving the region’s smaller breweries through a variety of options for contract brewing. (New) Construction has officially begun on the new Sam Adams taproom at Faneuil Hall (in the former Hillstone Restaurant space). Described as “a neighborhood social room to explore and enjoy classic favorites and innovative beers,” the plan is to brew pilot batches on site, though no details on an opening date have been announced, but our understanding is that it’s not likely to debut until the end of the year. (New) Another license that recently came through for Bull Spit Brewing in Lancaster. It’s affiliate, Kalon Farm, already produces its own wines, but no details have been shared yet on what the plans are for the brewery license. (New) Medfield based contract brand ZēLUS, makers of beer designed for active lifestyles, recently announced plans to open a brewery and taproom in downtown Medfield later this year. No world on a timeframe, but they hope to have it ready for the public before the end of the year. 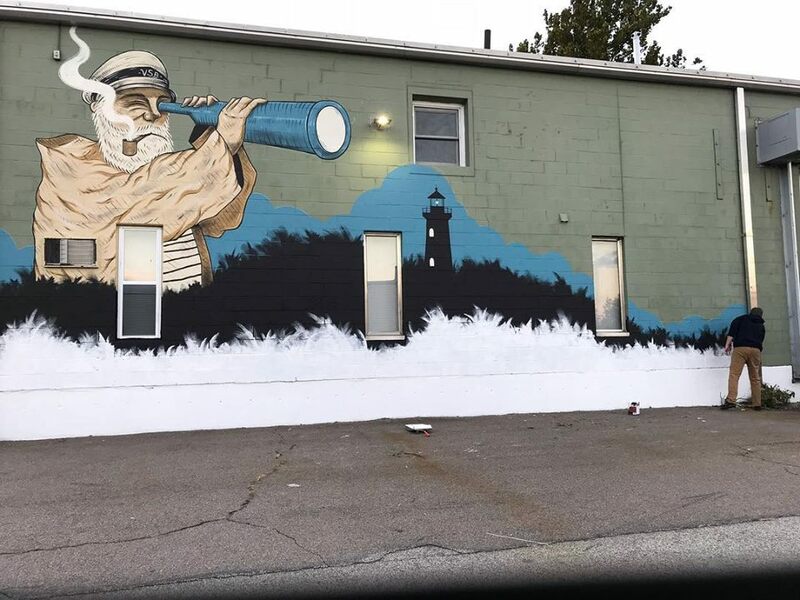 (New) Cape Ann Lanes in Gloucester has plans to renovate a portion of its interior into a brewpub. No word on a name or timeline just yet, but they already have a state license from the ABCC. A few other newbees we’re watching who might push for a 2019 opening include Great Marsh Brewing in Essex, Boston-based contract brand Time & Materials, and maybe even a comeback by Holyoke’s Paper City Brewing, who closed in 2017. Truth be told we know of a few others as well, but we’re sworn to secrecy until they’re ready to go public with the news. We’ve also heard rumors of expansion at Brewmaster’s Brewing Services, a full-fledged taproom for Merrimack Ales in Lowell, a move to a bigger space for Newburyport Brewing, and exciting forthcoming announcements from Hitchcock Brewing, Stoneman Brewery and a few others. Stay tuned. Feature Image Credit: The featured image is courtesy of Austin Design, whose portfolio includes iconic breweries such as Tree House, Lawson’s Finest Liquids, and The Alchemist. They are also currently working on four of the pending new breweries we mentioned in this story: Lost Shoe, White Lion, Medusa, and Loophole.